While Mexico is the fourth-largest producer of maize in the world, yields are low and very little seed planted by Mexican maize farmers is produced by domestic seed companies. The Mexican government and CIMMYT launched MasAgro in 2010, which is increasing the production of seasonal maize varieties in Mexico by developing more robust and productive seeds, and by promoting sustainable agricultural practices. A central component of the project has been the creation of an international consortium for the improvement of maize (IMIC), in order to increase maize productivity and strengthen the competitiveness of the maize seed sector, both in Mexico and more widely in the Latin American region. Now in its third year of operation, the consortium – which includes the regional maize seed industry, public sector researchers and CIMMYT – delivers elite germplasm, software tools and molecular breeding technologies to small- and medium-sized breeding programs in Mexico. In time, the same support will be extended more widely in the region. The MasAgro breeding program delivered 6.6 tons of basic seed to 19 small- to medium-sized companies and to Mexican research institutions in 2013. Companies that participate in MasAgro’s network have received 8 tons of seed of 16 maize hybrids adapted to Mexico’s rainfed growing regions. As a result, the companies will be able to multiply and to commercialize enough hybrid seed to sow 1 million hectares in 2014 (one-eighth of the total land used to grow maize in Mexico). These hybrids have the potential to yield 60 percent more than Mexican farmers’ average yield. In areas served by local seed companies and with higher productivity potential, MasAgro will help increase the use of improved seed by almost 50 percent. Although it normally takes five years to develop one or two commercial hybrids from more than 10,000 crosses per year, MasAgro benefited from the advanced hybrids that CIMMYT began to develop in 2011. As a result, smallholder farmers will have access to maize hybrids specifically adapted to their fields. IMIC also distributed 27.7 tons of pre-commercial seed of 16 maize hybrids to 18 companies and two public research centers in 2013. In sum, MasAgro has distributed 31 tons of pre-commercial seed to the companies that participate in its germplasm evaluation and exchange networks. To assist the distribution of seed for trials in the networks, IMIC developed an online seed request and management system in 2013. Breeders and managers of participating seed companies also received training in seed improvement and multiplication techniques, management and marketing practices. MasAgro offered four workshops on these subjects, including seed certification training for 22 technicians of Mexico’s Seed Inspection and Certification Service, and a workshop on DH technology for seed improvement for technicians from 19 companies. 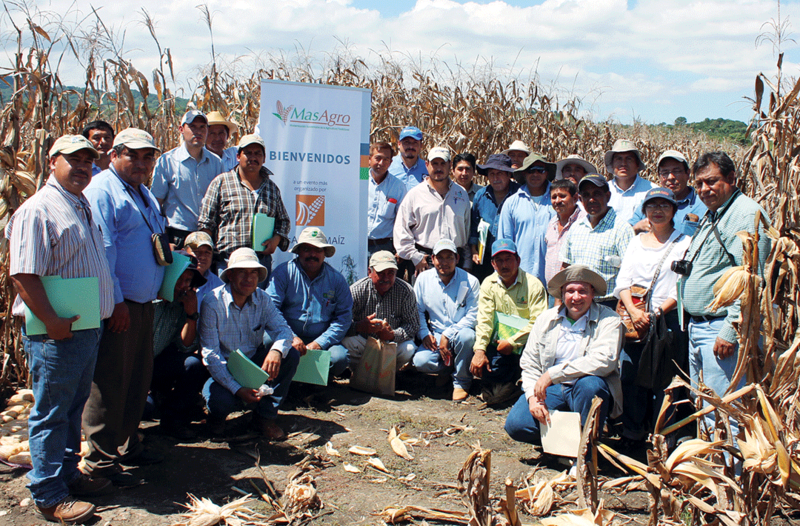 In three years, MasAgro has offered 23 workshops to IMIC partners. Finally, the MasAgro socioeconomics team concluded five studies that applied surveys to seed producers and to growers to identify priority intervention zones, and to estimate the potential growth of improved seed markets in Mexico. The findings show that 740,000 hectares in southeast Mexico and 372,000 hectares in the High Valleys have the highest productivity potential. Both zones combine high yield gaps with high potential use of improved seed. Seed companies in MasAgro networks could see their sales double by 2018 if these markets reach their full potential. Another finding from a study conducted by INIFAP confirmed that 54, 68 and over 90 percent of smallholder farmers in the states of Mexico, Oaxaca and Veracruz, respectively, want to use hybrid seeds. The studies also classified current maize productivity in the different regions of Mexico. Evidence showed that the most productive maize growing zone is western Mexico, followed by Bajío, the High Valleys, southeast, northeast and the landlocked northern states. To have the technology and genetic materials needed to raise average rainfed maize production in Mexico from 2.2 to 3.7 tons per hectare over a 10-year period. To increase the use of high-yielding, improved maize seed in Mexico over an area of between 1.5 and 3 million hectares. To raise Mexico’s production of rainfed maize between 5 and 9 million tons in 10 years. To promote the development of the maize seed industry in Mexico. To strengthen food security in Mexico and in the rest of the world.